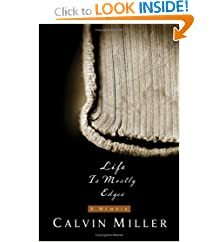 My Dad put me on to reading the memoirs of Calvin Miller entitled Life is Mostly Edges. Do yourself a favor: take an afternoon away, go to Borders, sit down with a cup of coffee and Calvin Millers book. Miller splits the book into three sections: 1. Childhood, 2. Life as a Preacher, 3. Life as a Professor. And while the childhood years were interesting I lost myself in his section about life as a preacher. He looks back upon those early years in ministry recognizing his mistakes, funny stories, difficult decisions, his family and the church, etc. I read the majority while in bed and would lay there laughing and then reading excerpts to Nicole. In one particular story he reflects on the conversations he had in Bible college and I thought it very humorous because I had the same conversations in Bible College. Again, do yourself a favor: go read this book. If you’re in the ministry or not you’ll read it from cover to cover. I did, twice!! !